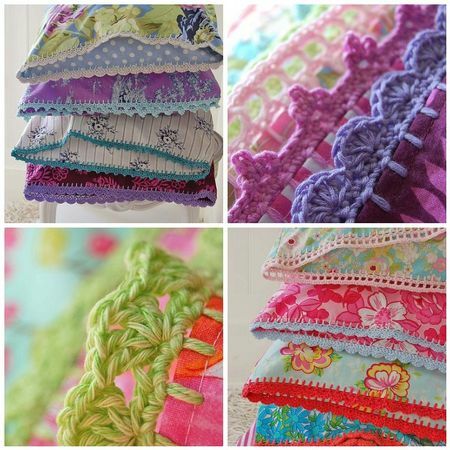 Look at this, I'm loving these beautiful pillowcases with crocheted edged borders. Cassie from You go girl has made a magnificent tutorial on these, http://www.yougogirl.typepad.com/ stop on over, she has a button and photos and oh, its just wonderfull, she did a great job. Inspiration and assitance Beata from http://rosehip.typepad.com/ , stop on over there too, you will be delighted (photos in these posts from these two sights, until I make some of my own). She also sells these in her etsy shop http://www.etsy.com/people/rosehip/favorites?ref=em , so if you want some instant joy, just stop over and buy some right away. The crohet along is done...but you can still look over the tutorial and crochet on your own, that's what I plan to do. 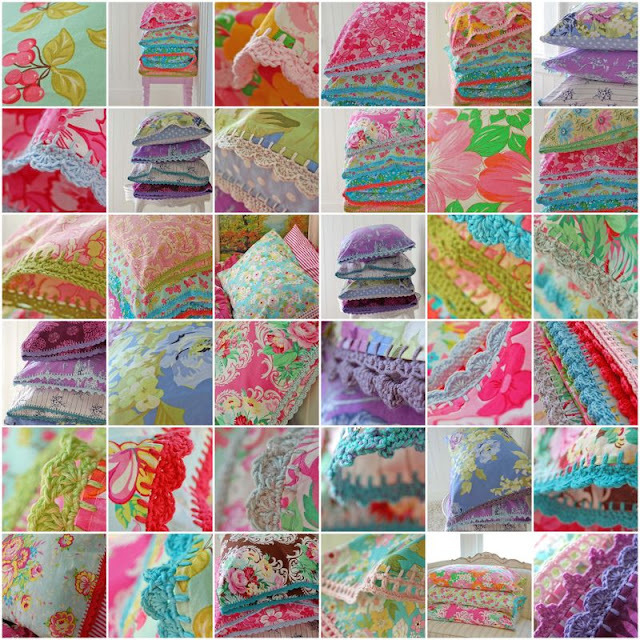 I am just crazy over this, I see borders on quilts, table runners, aprons, etc. I'm so excited, I don't have time right now, but look for my results in the future when things slow down, I plan on making some of these. oh man, I just saw this somewhere else too and I am so wanting to do it! I need new pillowcases in our bedroom anyway! My grandmother used to do this to all her pillow cases. I used to love putting my little fingers in the holes. They are all so beautiful. 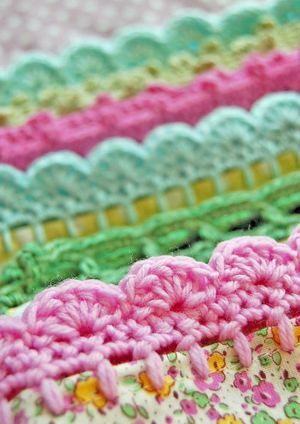 Makes me want to bring out my crochet needles. A wonderful and blessed Easter to you and to your family. 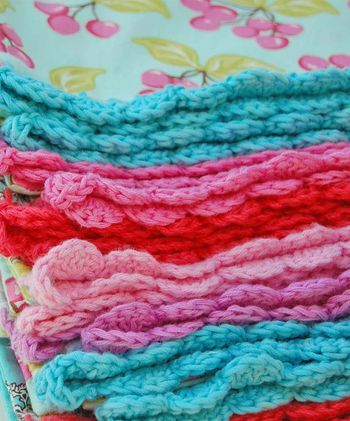 Oh I love crochet..it's one of my favourite passtimes! i'll go and visit her too now! thanks for the tip! I love it, so pretty! 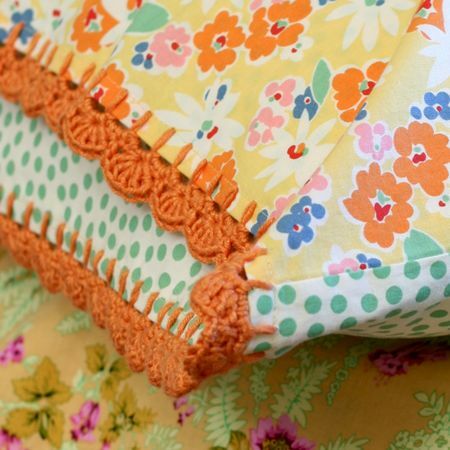 Lovely idea to add crocheted borders to fabric, like at these pillows! so sweet! I would think you could add those to a skirt or something else.. many ideas!